« AutoCAD 2012 new features! The Quick Select dialog box is a simple filtering device that helps you select the objects you want. For more advanced filters and for when you want to save filters, use the FILTER command. Here’s a simple drawing with some lines and blocks. I use this drawing to show you how to use Quick Select in the video below. Here’s the Quick Select dialog box. You use it by working your way from the top down. Watch the video tutorial below to see how to use the Quick Select feature. I also have a tip on how to find out how many insertions of a specific block are in your drawing. Read the comments, too, because readers came up with a couple of additional methods. How do you use the Quick Select feature? 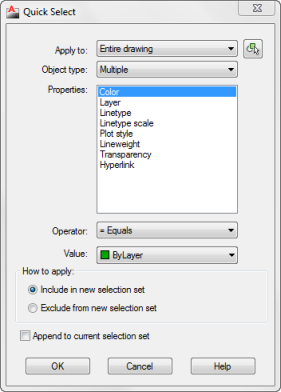 Or do you have other methods of creating filters for selecting objects? Leave a comment! Now tell me if I wanted to change the color of a particular block to another color, how would I do that. Hi Ellen, I’m trying to erase a bunch of tiny circles and don’t want to pick them 1 by 1. I thought of selection sets, but I’m not too familiar with using them. Right then, I got your email newsletter, hence, this post. I get how to create a selection set with qselect, but how do I do something with the selection set? Do I need to name and recall it? Good question! You use the P (Previous) option in the next command’s Select object: prompt. This picks up the previous selection set. Or, if the objects are still selected, just start the ERASE command to apply it to the selected objects. Does either of these work for you? Hi, my company recently updated versions from 2010 to 2012 (autocad map 3d) and i had changed the “qselect” keyboard command to “qs” for timesaving. I thought it was an alias but i am unable to find it again. How do I change it from qselect to qs again? I this is what you want: https://allaboutcad.com/speed-up-your-work-with-command-aliases/. How to create a command alias. Hello. I frequently find myself updating and converting old drawings, and, needless to say, I use QUICKSELECT quite a bit. I am looking for a script or macro that I can use that will automate the process. I can’t seem to find a way around the required user input for QUICKSELECT. I usually know in advance what layers I will be converting. Do you know of any macros that do this? Thank you very much. Hi Ellen, I need to use QS a lot, counting blocks for a plant schedule. Is there a way to count all blocks (plants) simoultaneously? Like asking the program to give a complete count of all blocks in the dwg? Some settings are saved in the drawing; others in the Windows Registry. I’m not sure which the cursor setting is, though. It’s pretty easy to look up in Help. I am having a brand new problem that I suspect is something to do with “selectsimilar”. My drawing contains numerous plans & sections of the same object (cable ladder) as it travels through a building. This means that a lot of the annotation for the different plans & sections is the same, just in a different location on the drawing. As of today, when I move a note (Mtext & leader arrow) onto a previously aligned note on a new plan or section, and then attempt to realign the new note via “select/previous”, ACAD moves both pieces of text. The leader doesn’t move, the “old” piece of text is not in reverse video, as one would expect if it was selected, it makes no difference if the new note is moved to a circle/line drawn onto the insert snap point of the “old” note, both texts are selected and moved. As both pieces of text are in the same layer, same style, same height etc etc and only differ in content (text value) I suspect the selectsimilar function is being invoked automatically. How can I turn it off? Or make the parameters of selectsimilar so wide no two objects are selected? I’ve been using ACAD 2013 on 3 different machines without this problem, which only started this morning on this machine, which was previously working just fine. Any suggestions will be gratefully received. Thanks. Is there a way to select objects by attribute? Example: I import a water pipe network from GIS to C3D. I choose to bring over attributes such as pipe length, diameter, etc. Now, I want to be able to select all 6″ diameter pipes on the layer I specified. is that possible? Keep in mind, the object is a line, not a “pipe” as defined by CAD. Thanks. Please check this tip of mine on the Cadalyst CAD Tips, it should answer your question. Hello friends, im using Autocad 2015 , i want to give the order of my numbers , when i use the command TCOUNT , but it does not work , in 2009 it woks but not in 2015 , it just changes to QSELECT ..
dear i have a problen in autocad. if we mirror or copy an object to new place then if we need another copy of that object we simply type command (co↵p↵). so the prevouse object select again which if we want to select the new copied object what will be its command. 100 numbers are there in that drawing.. I really enjoy studying on this site, it contains great blog posts.